A French favourite – choux pastry buns filled with a smooth vanilla crème patissiere (pastry cream) and coated with dark chocolate ganache. Each bun is decorated with a frilly white collar of whipped crème to make it resemble a miniature nun. 1. Start by making the choux pastry. Heat your oven to 220C/425F/gas 7. Draw eight 5cm circles and eight 2.5cm circles on the paper lining the baking sheet. 2. Put the butter and water into a heavy pan and heat over a medium heat until the butter has completely melted, then bring the mixture to the boil, taking care not to burn the butter. Remove from the heat and tip in the flour. Stir vigorously with a wooden spoon until the mixture forms a soft ball. Set the pan back on low heat and cook for 3-5 minutes, stirring constantly, to dry out the dough. Remove from the heat and leave to cool slightly. Gradually add the eggs, beating well after each addition, to make a smooth, shiny paste. 3. 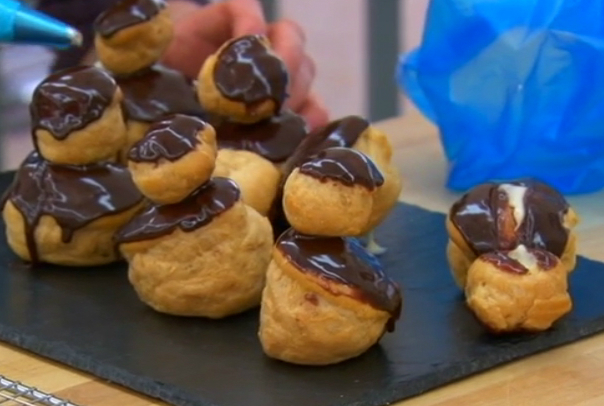 Spoon the choux dough into a piping bag fitted with a 1.5cm plain tube. Pipe discs inside the drawn circles on the baking sheet. Dip your finger in water and gently smooth the top of each disc. Place in the heated oven and bake for 10 minutes, then reduce the oven temperature to 190C/375F/gas 5 and bake for a further 10-15 minutes until a good golden brown. 4. Remove the baking sheet from the oven and pierce each bun with a skewer to allow the steam to escape. Return the choux buns to the oven and bake for 4-5 minutes so they dry out. Transfer the buns to a wire rack and leave to cool. 5. Meanwhile, make the crème patissiere. Pour the milk into a heavy-based medium pan. Using the tip of a small knife, scrape out the vanilla seeds from the split pod and add to the milk. Slowly bring to the boil, then remove the pan from the heat and set aside. Put the egg yolks and sugar into a heatproof mixing bowl and whisk together until pale, then add the cornflour and flour and whisk in. Continue to whisk as you pour on the hot milk in a thin steady stream. Pour the mixture back into the pan. Set over medium heat and bring to the boil, whisking constantly. Cook for 1 minute until smooth and thick. Pour into a bowl and cover the surface of the crème patissiere with clingfilm (this prevents a skin from forming). Leave to cool, then chill. 6. For the chocolate ganache, bring the cream to the boil in a small pan, then remove from the heat. Add the pieces of chocolate and stir until melted and the mixture is smooth and shiny. Transfer to a bowl and leave to cool, then cover and chill until the ganache has a thick coating consistency. 7. To assemble the religieuses, spoon the crème patissiere into a piping bag fitted with a long thin tube ( or use a jam or icing syringe) and fill the choux buns through the ‘steam hole’ made earlier. Dip the tops of the filled buns into the chocolate ganache to coat them halfway up the sides. Set a small bun on top of each large bun. 8. Whip the cream until it will stand in peaks. Spoon into the clean piping bag fitted with a star tube. Pipe a line of cream around the join where the two buns meet to form a white collar. Serve as soon as possible after assembling. This recipe was taken from The Great British Bake Off: Everyday – get your mitts on 100 foolproof recipes now.